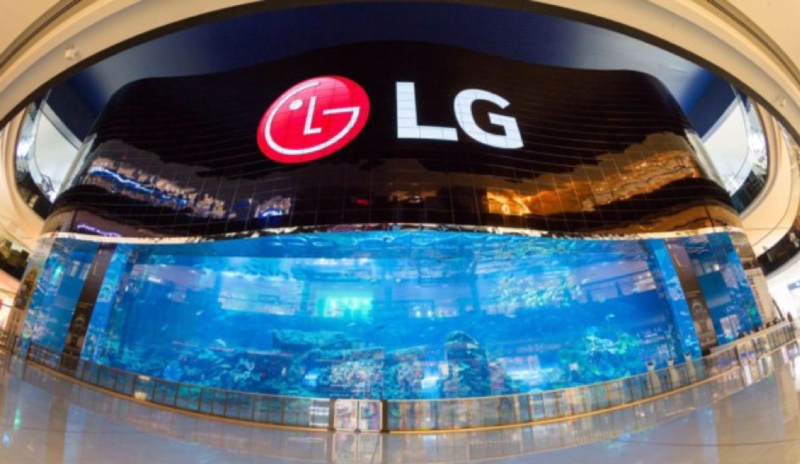 LG Electronics redefined the possibilities of signage design with the recent unveiling of its revolutionary LG OLED video wall now on display at the Dubai Aquarium & Underwater Zoo. Securing three Guinness World Records, the display was designed and built using 820 LG OLED Open Frame display panels. This achievement was the direct result of the collaboration between LG and Emaar Entertainment – operator of the Dubai Aquarium & Underwater Zoo. Dubai experiences a high volume of tourists each year. As a result, the Dubai Mall is one of the most visited in the world. At the center of the roughly 5.9-million-square-foot mall sits the amazing Dubai Aquarium & Underwater Zoo. To showcase Dubai’s innovation to the world in one of the city’s most visited sites, Emaar Entertainment sought to replace their existing static signage with dynamic, cutting-edge digital displays at the aquarium and truly capture the attention of the mall’s more than 80 million annual visitors. To do so, Emaar chose LG OLED digital signage displays for their unparalleled flexibility and unique design, installing 820 LG OLED Open Frame panels to create a massive video wall display. This feat has since been awarded three Guinness World Records for the “World’s Highest Resolution Screen,” “World’s Largest OLED Screen” and “World’s Largest Video Wall.” Building such a unique installation came with certain challenges the collective team worked to overcome during implementation. With the incredibly large scale of the project, the integrators, end users, manufacturer, software provider and content provider needed to work very closely in the planning phases to ensure build-out went smoothly and according to plan, especially since the end user had no preview experience in OLED installations. The size of the project also presented concerns about hardware weight. The displays implemented would need to be relatively lightweight while also providing high-end, state-of-the-art picture quality. By working together, all stakeholders were able to address the challenges of the project in a timely and efficient manner. During implementation, LG and Emaar maintained close communication to assure that each step of the process was completed smoothly. The partners were able to address the logistical concerns of the installation environment. While OLED had never been installed on such a broad scale, LG is well known for large-scale installation projects around the world, making them the right manufacturer for the job. Even more, LG OLED Open-Frame panels offered flexibility in design to precisely meet the unique size and weight restrictions of the venue, all while providing Emaar “wow-factor” displays with perfect black levels – and therefore infinite contrast – to display vibrant colors, immersive details and truly lifelike images from virtually any viewing angle turning the Dubai Aquarium & Underwater Zoo into an eye-catching global masterpiece. As a result of the seamless connectivity of the Open-Frame LG OLED commercial displays, the 820 panels used for the project were successfully installed in three mere months. The incredibly immersive picture quality of LG OLED and unparalleled size of the video wall enabled Emaar Entertainment to transform the Dubai Aquarium into a one-of-a-kind venue that both attracts and impresses the mall’s millions of visitors. Today, the project is still considered by many to be the Gulf regions premiere digital signage attraction.